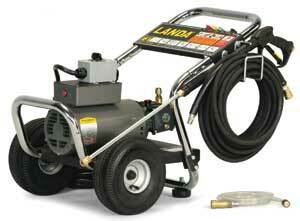 Landa’s Heavy Duty electric-powered, cold water line is the PDE. All models feature an industrial-grade motor direct-coupled to a tri-plunger high-pressure pump. Other features include vibration-absorbing rubber feet; chrome front and back handles for convenience in loading and unloading; insulated, two-piece, straight-through wand; and 50 ft. wire-braid hose rated for 3000 PSI.